I'm cheap. As such I often embark on unorthodox projects that will save me money. These are my adventures. Have you ever looked at under-cabinet lighting in the big box stores and wondered why it's so expensive? It's really not that hard to set something up yourself. I'll explain how I put in under-cabinet lights at minimal cost. Some of the materials I bought on eBay from China, which takes at least a month to come in the mail, so some patience is required. I used LED strip lights. You can buy them in rolls on eBay. You will need to measure the length of all the cabinets to figure out how much you need. I ended up putting 2 rows of LEDs under each cabinet. I bought a 5 meter roll, and still had a bit left over. But our kitchen is fairly small. If you buy larger LEDs, you may decide that only one strip per cabinet is ok. The size of the LEDs are given by a four-digit number. For example, I bought 3528 LEDs. That means each LED is 3.2mm x 2.8mm. You can also buy 5050 LEDs, which are 5.0mm x 5.0mm, which should give more light, if you want it. Once you decide how much and what size you want, search eBay. For example, "5m 5050 LED strip". You can buy a 5 meter strip for under $10US. Many sellers have several options, like the color. So make sure you're not buying red LEDs if you want white. You can also find soft white or cool white, depending on your preference. You can buy waterproof strips, which have a silicone covering over the whole strip, but it costs a little more, makes the wiring a little trickier, and it's unnecessary in this application. But it'll still work, if that's what you prefer. LED strips are designed so that they can be cut every 3 LEDs. There are special LED connectors that make it easier to wire the strips you cut off. Search for "2 pin led connectors". These will clip on to the LED strip and have short wires that you'll connect to power. Make sure you buy enough so you have one for every strip you cut off. You can buy a pack of 10 for just a few dollars. 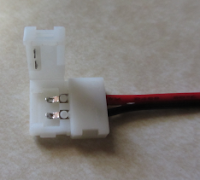 If you want to make any 90-degree turns in your LED strips, you can also buy special connectors to do that too. These LED strips run on 12V, so you'll need a properly-sized power supply. You have to be aware of how much current will be required to power all your LEDs. The current depends on the size of the LEDs and the number of LEDs per meter. The short story is that 5 meters of 3258 LEDs at 60 LEDs/m would require about 2.2A. If you buy 5050 LEDs are 60 LEDs/m, that will draw about 6.6A. Be generous with your calculation. Using an oversized power supply won't actually use more power. It'll just make more power available, which is a good thing. I'm using a 5A power supply for the about 4.5m of 3258 LED strip that I used, which I also bought on eBay for under $10US. You might even have a power supply laying around your house that you can use! If you have an old, unused laptop power supply, check if it's 12V and puts out enough current. 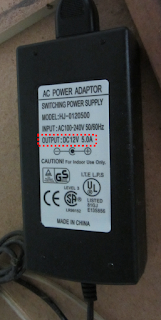 If you're not even going to use a full 5 meters, you might even be able to use a small "wall wart" type power supply. But those small ones don't usually put out any more than 2A. You will also need some wire to run to the bottom of your cabinets. I used some fairly thick speaker wire, which was totally overkill and doesn't look that nice under the cabinets (although you can't see it when you're standing up). Just about any thin wire will do, but you might think about matching the colour of the bottom of your cabinets. If you are going to put your power supply on top of your cabinets, like I did, you will need enough to run to the bottom of each cabinet. It's also handy to have some heat shrink tubing to cover the connections between the LED connectors and your wire. Again, you can match the colour of the bottom of your cabinets, although anything other than black might be harder to find. This stuff is pretty cheap, even if you buy it locally at an electronics store. You will need to decide where you will plug in your power supply. Our house already had a light over the sink, with a switch under the cabinets. The wire from the switch came out of the wall above the cabinets, so I decided to hook into that to feed my LEDs, so the under-cabinet lights come on with the light over the sink. I cut the wire feeding the light where it came out of the wall and installed a receptacle there. It is better to run the power in parallel, that is, split the power and run it to each cabinet. So if you have 4 cabinets, run 4 wires from your power supply to each cabinet. I used this little device you see in the picture to split the power called a "wire terminal block". You can find them on eBay as well as some local hardware stores. I cut the connector off the end of the wire coming out of the power supply so I could connect it to the block. 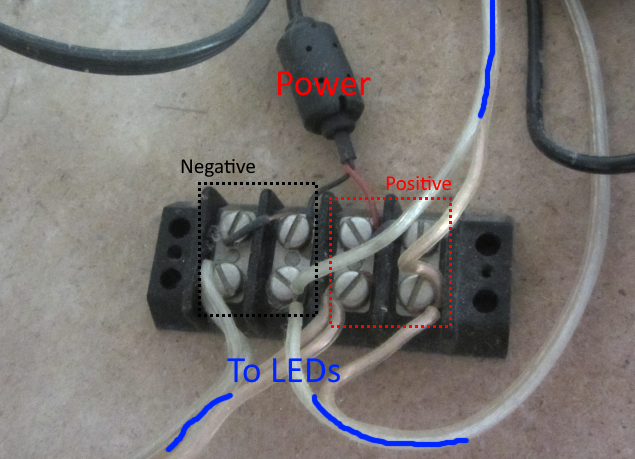 Make sure you get the polarity right: connect the positive wire from the power supply to the positive wire of your wire. The wires will usually have a different colour wire (sometimes red for positive, black for negative). Sometimes both wires are the same colour, but the positive but have a line (sometime dotted, sometimes solid) running along it. Some power supplies have no difference in the wires at all, which means you will need to use a multimeter to figure it out. LEDs just won't work if you get the polarity backwards. It won't damage them, they just won't light up. You can feed the power in series, that is, run wire from the power supply to the first cabinet, then connect the end of that LED strip to the next, and so on. But you may find that the LEDs at the end of that series will be dimmer than the first ones. Run the wire from the power supply down each cabinet. I drilled small holes in the back corner of the cabinets and ran the wire inside the cabinets. I pulled the shelves out a tiny bit to allow room for the wire behind them. Cut your LED strips to size for each cabinet. Remember that they can only be cut in specific places, which are marked on the strip. Attach one connector to each strip. Make sure you get the polarity right: the positive wire (usually red) is connected to the + mark on the strip. And make sure the metal tabs in the connector are on top of the metal on the LED strip. Attach the connectors to the wire coming from the power supply. If you're using heat shrink tubing, cut a piece of that and slide it on first, before you connect the wires. I recommend you solder these connections, but twisting them together would work too; the heat shrink tubing will keep it together. Use a hair dryer to shrink the tubing. The tubing does a few things: make it pretty, adds some strength to the joint, and keeps the positive and negative from touching each other (which would shut your lights off). Test it! Apply power to your power supply and (hopefully) watch it light up! If any of the strips don't light up, check your connections to make sure nothing is lose, and that the polarity is correct. If your LED strips did not have plus and minus signs, you may have to flip the whole strip around to correct the polarity. Now that you're sure everything is working, peel the back off the LED strips and stick them to the bottom of your cabinets. I put them close to the front, so they're hidden by the lip at the front of the cabinets. The other wires will need to be stuck to the cabinet too, so they don't hang down. You can use some silicone, some crazy glue, or double-sided tape. Whatever you use, you'll likely have to apply pressure to it for a few minutes at least to make sure it stays in place. I used a piece of wood wedged between the wire and my counter top. Once everything is dry, enjoy! My total cost was less than $20US. Install new TPMS sensors in your tires by yourself!